When my Friend Fiodor IZ7YBG told me about his YCP experience I decided to apply myself. I have been chosen for ES5TV station for ARI DX contest so I booked flights to Tallinn. I met Tonno and he brought me to the station, where I met Oleg, YL3DW and Valeri, ES5QA. Tonno gave me a nice welcome to his station, he explained me how the station works. The Friday evening before the contest he let me use the station for practicing, I made some QSO’s together with his son Jasper, ES5JASS. Other people joined us for the contest, and at 12:00Z Saturday the contest started. 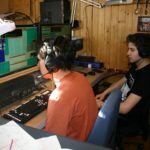 This was first Multi operator-Multi station contest for me and I learned many things, especially how big contest station works. I have been awake all night long as I was so enthusiastic about the contest. Even once the contest was finished, I could not get “ES9C CQ Contest” out of my head. Tonno managed everything perfectly, he picked me up at the airport and provided food at the station. 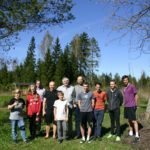 It had a lot of fun operating with the Latvian guys: Kristers YL3AJA, Oskars and Ritvars (from YL1ZT); I am also glad to have met Tarmo, ES5NHC, Tauri, ES5HTA and many other people. The funniest thing was when I was speaking Italian to the Italians stations because they did not expect an Estonian station speaking their own language! I am very happy for this experience, it has given me the opportunity to improve my ham radio skills, seeing a big gun station, but also meeting new people and visit a new country. The day the contest finished I got the chance to take ferry to Helsinki (only 80km from Tallinn) and I visited Finland too. I suggest every youngster to apply for the YCP, you will not regret!